Hafiz Khan dominated most of Day 2 play in the #TVWSOPCircuit Main Event. He began the day as chipleader, eliminated six players from his starting table, 3 in the first level of play, and early in the day had twice as many chips as second place with 100 players left. Khan didn't lose the chiplead until there was 15 players remaining. He ran solid the rest of Day 2 and throughout today's final table, collecting $188,686 as the champion, moving his TVPokerRoom tournament earnings to more than $300k. Khan had a competitive stack for most of final table play, but it was Roland Shen who took a dominant lead 3-handed. Shen took two massive pots from Greg Guth, then eliminated Guth in 3rd to start heads-up play with a 4-1 lead over Khan. It took more than an hour for Khan to be all in and be called, doubling through Shen. Khan was behind 10-1 in chips just before that double. An orbit later, Shen tanked for more than 5 minutes before folding to a river shove from Khan, and the lead was down to close to 2-1 and play changed considerably. Khan gained control heads-up after another 45 minutes and went to to earn the win in a match that lasted just a few minutes shy of four hours. 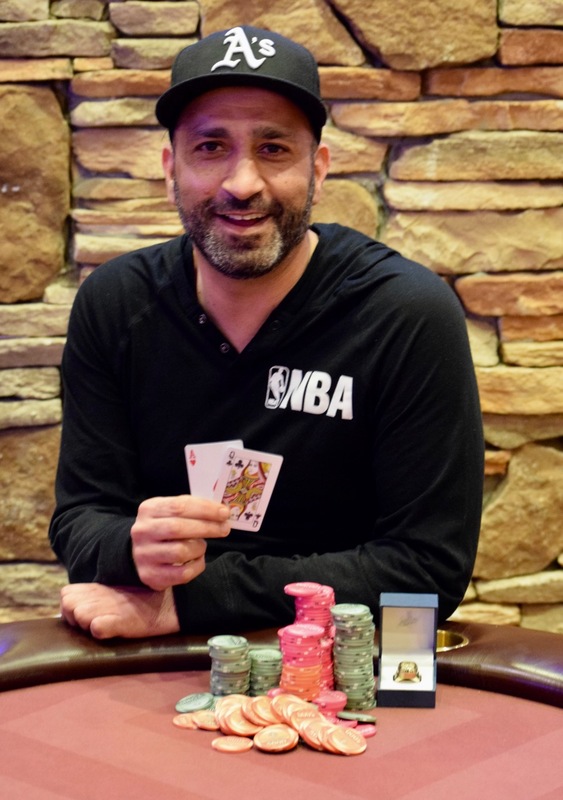 Khan earned the $188,686 payday, a WSOP Circuit ring and an automatic entry in the 2018 WSOP Global Championship Million Dollar Freeroll. Khan was 3rd last weekend in the 1,511-entry $300,000 Guaranteed $365 opening event of the series, 8th at the WPTDeepStacks Season Championship Million Dollar Guarantee here last month and also 5th at the WPT Rolling Thunder Main Event here last March. Shen earns $116,706 as runner-up. He flopped a pair, all-in preflop on the final hand, only to see Khan river Broadway for the victory. Monster Stack ring winner Michael Scott was 5th ($47,647). Other notable cashes included circuit cash number 101 for Charles 'Woody' Moore, 17th for WPT Champions Club member Lee Markholt, 27th for WSOP Colossus champ Ben Keeline (3rd in the WPTDeepStacks Season Championships here last month), 30th for 2017 WSOP Global Champion Sean Yu, 51st for former Ante Up World Champ Justo Avalos and 61st to last month's WPTDeepStacks Season Champ at TVPokerRoom, Jeff Fielder.